Gorilla Radio blog: Does UN Selective Ghouta Outrage Signal More Ominous Things to Come? Does UN Selective Ghouta Outrage Signal More Ominous Things to Come? Western governments, their corporate news media, and even the United Nations’ chief Antonio Guterres are once again playing a disgusting, emotive propaganda game over the Syrian war. UN Secretary General Guterres told the Security Council this week that the East Ghouta enclave near the capital Damascus was “hell on Earth” and called for an immediate ceasefire. His ceasefire call was echoed by French President Emmanuel Macron. 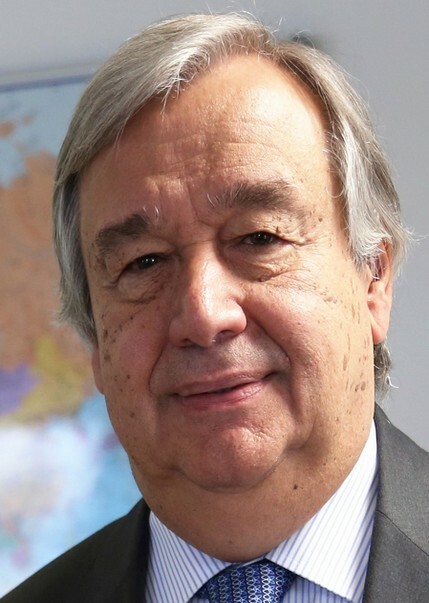 Where is Guterres’ public concern about “hellish conditions” elsewhere? In Gaza where more than a million people are starving under a years-long blockade by a US-backed Israeli regime – in violation of countless UN resolutions? Where is Guterres’ legal or moral authority for Palestinians? Or for Raqqa, the Syrian city razed to the ground by US air strikes? Or for Iraq’s Mosul, likewise obliterated along with thousands of civilians by US air strikes? Or for Sanaa, the Yemeni capital being bombarded by American-supplied Saudi warplanes? We don’t recall seeing the UN chief pointedly addressing the Security Council about those situations, and dramatically invoking “hell on Earth”. The trouble with the Western-orchestrated “concern” over Syria’s East Ghouta is that is so selective, cynical and a sickening sleight of hand. Western media outlets have this week stepped up airing one-sided footage out of the militant-held East Ghouta suburb, along with shrill demands for the US and other governments to “take action”. The implicit message is for greater military intervention in Syria by NATO nations to confront the Syrian government. The Syrian government and its ally Russia are being accused of massacring civilians with air strikes on East Ghouta. Russia has denied its forces are deliberately attacking civilian centers, while the Syrian government claims that militants from East Ghouta are launching deadly mortar attacks on nearby Damascus, and therefore has the right to put an end to the insurgents’ fire. One wonders how Washington, London or Paris would react if in a similar position? Ruthlessly and self-righteously, rebuffing any international concerns as “interfering in its sovereign affairs”. Shamelessly, Western media outlets are once again giving one side of the story in Syria and a very distorted side too. They are making tenuous comparisons with the conflict over East Aleppo back in 2016. Back then the Syrian government and Russia forces ended the siege of Syrian’s second largest city by routing militants who had held the eastern quarter for nearly four years. A victory for the Syrian people was perversely distorted by the Western media to appear as a brutal conquest involving massacre of civilians. This week the Aleppo myth is being reprised in the Western media with the same barefaced lies. “The scenario is similar to the regime’s [sic] slow, destructive reconquest in 2016 of rebel-held [sic] areas in Aleppo”. Quoting “activists” from East Ghouta, the Post depicts an infernal scenario of “hospitals overflowing with blood”, “graves filled with body parts”, and “children sitting alone amid rubble”. This is an exact replay of the Western narrative over East Aleppo, when Syria and Russia were accused then of “war crimes” and compared to “Nazi Germany”. One pressing corrective question is this: why have Western and UN officials, as well as Western media, not gone to report on Aleppo since the city returned to full Syrian government control for over a year now? Why have these hand-wringing protagonists who were hysterically protesting “war crimes” and “slaughter” in Aleppo not followed up to check on their earlier claims of mass slaughter? Yet they are making the same scripted claims again with regard to East Ghouta. One reason is that they would find in Aleppo a population which has happily returned to peaceful normalcy after the Syrian and Russian forces liberated the city from the death-grip of terror groups like Al Nusra Front. That’s why Aleppo is not in the Western “news” any longer. It doesn’t fit their propaganda narrative. 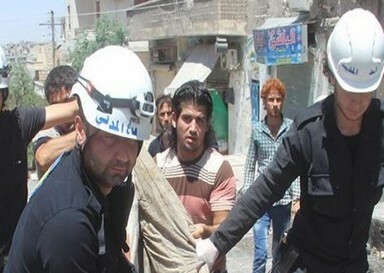 During the liberation of Aleppo, the Western media relied solely on videos and claims issued by the so-called “humanitarian responders” and “activists” of the White Helmets. This pseudo first-aid group has been unmasked by Vanessa Beeley and other investigative journalists, to be a media arm of the Nusra terror network and its various Islamic State (IS) affiliates. In East Ghouta, the Western media are again relying on the White Helmets for their “information” about what is going on in that enclave, just as they had done in their fabrications over East Aleppo. Western media are not reporting on a war; they are part of the war, disseminating propaganda for terror groups like Al Nusra, who are covertly sponsored and directed by US, British and French military intelligence to destabilize the country. The Washington Post deceptively fabulates about East Ghouta as “the last bastion of opposition rebels”. It published a map apparently showing East Ghouta as “rebel-held” and distinct from another area which was designated under the control of “Islamic State”. All the Western media engage in this sophistry of contriving a seeming separation between “good rebels” and the “terrorists”. The fact is that East Ghouta has been held under siege by Jaysh al Islam (formerly Liwa al Islam) for the past four years. This group is an affiliate of the cult terror-network comprising Al Nusra and so-called Islamic State. They rule over captured areas with a bloody sword, decapitating anyone deemed to be an “infidel”. The comparison of East Ghouta with East Aleppo is real enough, but not in the make-believe propaganda nonsense way that Western media are portraying. Audacious falsification by the Washington Post was further compounded this week when it tried to underscore the suffering in East Ghouta by claiming the area was “hit with chemical weapons in 2013 by the regime [sic]”. That is an outrageous lie that has been already exposed by several independent journalists, such as Seymour Hersh, who showed that it was the Jaysh al Islam militants (the so-called “good rebels”) who carried out the 2013 atrocity against civilians under its control as a deliberate false flag attempt to trigger US military intervention in Syria. Similar to the stunt pulled last April in Khan Sheikhoun, in Idlib Province, which President Trump reacted to three days later with a barrage of 57 Tomahawk cruise missiles slamming into Syria. The repugnant irony of Western media and the UN chief calling for tougher Western government intervention in Syria is that it is precisely because of Western governments intervening in Syria for regime change that has resulted in the present devastation and suffering of the country. Western media will never tell the full story of how past US administrations in league with their NATO allies, Israel and other regional client regimes were plotting for years to destroy Syria as part of a wider war plan to control the oil-rich Middle East. The proxy war in Syria for the past seven years has followed the war plan laid out by pro-Israeli American imperialists in Washington like Richard Perle and Douglas Feith. In their “Clean Break” plan from as far back as 1996, Syria and Iraq were a priority for “roll back” or regime change. The list of Mideast countries targeted by the US for regime change, including Syria and Iraq, was confirmed by American General Wesley Clark in 2007. This is how the suffering in Syria we are witnessing today has come about. Want to end the misery and horror in Syria? Then the US and its accomplices, including Britain and France, should get out of Syria and stop waging their covert war for regime change. Western media will never elucidate that truth because their purpose is to tell lies about lies, and to manipulate Western public into supporting ever-more criminal war.